If you are browsing for the best drum set for kids available right now, but you the lack time to explore options on your own, our carefully put together guide should be fun and exciting while providing quality alternatives. As we went through expert opinions, one set stood out – the Ludwig Junior. It offers plenty of pieces, its construction is solid and ideal for intensive practice sessions, and it has a design that appeals to kids. The model is also easy to put together and to move around. As an equally quality choice, we offer you the Gammon Percussion 5-Piece. Suitable for beginners and more advanced players alike, this drum set will help your kid take the drum fun to the next level. Including several pieces such as a 16″ bass drum, a snare, and a cymbal, this model ensures enough versatility for the junior player to explore new sonic realms. The kit comes downsized, which makes it ideal even as a gift for a kid interested in playing drums. Check the dimensions of the product before you buy as it proved to be too small for a 10-year-old. Including various pieces for a full drum experience, this kit is made to last and perform. Including five pieces that deliver sonic versatility and diversity, this set is another option you might want to try for your kid. You will also get cymbal stands and all the accessories needed to mount the set right away. The materials used ensure durability and the dimensions will make sure the set won’t take too much space. The high-gloss finish with chrome or black rims will add great visuals to your gig. Make sure the product dimensions will accommodate your kid. The set proved too small in some cases. The unit is easy to mount and offers sonic diversity thanks to the pieces it includes. Recommended for 7 to 15-year-old drummers, this set comes with a 16″ bass drum, a 10″ hanging tom, a 10″ snare drum, a pedal, and drumsticks so you can start playing the moment you get it. The product is also a good option for people who are not over 5ft tall. You also get a drum throne that can be adjusted to accommodate your kid’s needs. The item also promises to keep up with extended use. According to some customers who got this product, the set does not come with directions for assembly. Help your kid explore the sonic beauty of drums and get creative with this 3-piece set. Down in the list below, you have a nice selection of products picked based on kids’ drum set reviews. Each piece is improved to fit a child’s size and needs, and we’ve made sure each and every one of those alternatives can survive those little moments of clumsiness kids have from time to time. This drum set is a kid’s dream came true. Both beginners and experts can play it, and it features many pieces that you can take advantage of. For example, you get a 16″ bass drum, which has compact dimensions, and a cymbal stand with the provided cymbal. Each piece is solidly crafted so that it can survive even intensive playing sessions. The top-notch Ludwig kit comes downsized, so children of all ages can play it. This makes it ideal as a gift for talented young people. The cymbal will help them learn rhythm, and since all the pieces of the set are created to respect the industry’s stands, your kid will get a sense for notes in no time. The drums are solid, and they won’t disappoint. Furthermore, the snare is an entry-level item, but capable of excellent sound if tuned with the help of a tuner. The hardware is easy to adjust and sturdy so it can survive whatever children throw at it. Another set that can be an excellent starting point for juniors is this one from Gammon Percussion. It contains five pieces that will provide sonic diversity, and will allow your baby boy or girl to experiment with sound. Investing in this model means investing you your kid’s creativity. It makes for the ultimate gift because each piece is made with attention to detail and to last a lifetime. Besides the five drums, you also get cymbal stands and all the other small accessories needed for the mounting process. They do not weigh a ton, and because the bits have a reduced footprint, they don’t take too much space in your room. The set has a high-gloss finish with chrome or black rims. They are easy to clean and maintain, and their surface is resistant to scratches, which is more than necessary as you transport them from one concert to another. If you want something that can last for generations, this is an option that will offer you the longevity you’re seeking. By opting for it, you get the three drums, a pedal, and some very handy drumsticks. The average age the set is recommended for is 7 to 15, or for young people who are not over 5ft tall. Some of its components are the 16″ bass drum, the 10″ hanging tom, and of course, a 10″ snare drum with a stand. These tools are more than enough for any young mind looking to explore the intriguing world of music. More pieces would be confusing and intimidating, and that’s why reviewers praise this balanced model. The 9.5″ cymbal is excellent for rhythm practice, and the padded drum throne can be adjusted according to your kid’s needs. This is another great detail because the product can match the fast-growing height of your child. The product sure has great style! It comes with three high-quality pieces, which have an enhanced size ideal for kids between the ages of six and seven. You also get two hanging tom-toms with your purchase and a bass pedal. In a sense, it features everything you need to get started right away. The manufacturer included a lightweight pair of sticks and a stool. The drumsticks are made of wood, and everything is easy to set up since the seller also provides you with the necessary instructions. The set is light and can be easily transported when or if needed. The kit is essential if you want to build the foundations for music education, and it is crafted from real wood with chrome hardware, which is one of the many things that set the junior drum kit apart from alternative plastic kits. Moreover, its blue color is going to appeal to both girls and boys. 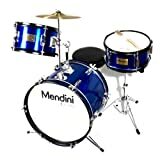 This Mendini by Cecilio five-piece set is an ‘all-in-one’ kit designed specifically for all entry-level drummers, and it is highly functional and ready for your kid’s concerts. It can be an excellent gift for the young boy or girl who wants a realistic and fun experience but might be too small for a full-size drum set. The product comes from a trusted seller, who’s been in the industry for years and is known for its quality pieces. In the box, you get a 16″ bass drum, two tom-toms, a 10″ matching snare drum and an extra 12″ floor tom. The drum throne has an adjustable height, and the drumsticks provided are made of wood. The reviewers emphasize that this model is solidly crafted and made to last a lifetime. And, although assembling it is required, you do get easy to read setup instructions which will make this mission much more straightforward. The brand created a model that can stand the test of time. Furthermore, it can help you ignite the love for music in your little one since the 3-piece kid drum set is easy to play. The sound it provides is balanced and accurate, and more importantly, distortion-free. The pieces are made of an all-wood design with expensive chrome-plated hardware, details which make this durable kit survive years of practice like a pro. It is complete with toms, a cymbal, bass and many more, meaning your child can experiment with sound however he or she pleases. Its premium quality is not the only feature that stands out. For example, the attractive construction emulates an adult drum set style at a smaller, more fun scale, ideal for small children and their delicate hands. The cushioned stool is another cool addition that is going to make drum lessons comfortable and pleasurable. Red is a bold color, and so is this set. It can be an unexpected Christmas present for a kid who’s about to embark on a musical journey, or the primary set for a young artist who’s already having concerts. To set it up it’s easy, and it’s comfortable and intuitive for a child to practice on it. The surface of the product is scratch resistant, and the metal elements used for its construction are rust-resistant and sturdy. Needless to say, it features plenty of sturdy pieces and accessories so you won’t have to make any extra buys, which is a welcomed bonus. You get a stable bass drum, the tom-tom with an included holder, drumsticks and all the required assembly instructions. Putting it together with your son or daughter can be a fun and educative family activity, which will only strengthen the special bond you two share. If you want to make things easy for your kids, and also get a modern device that will appeal to them, invest in this product. It is a device that takes portability to new heights. The four-pad tabletop electronic drum kit comes with drumsticks and plenty of built-in learning tools. This way, you could even skip music lessons, especially since you can double their efficiency with online classes. It requires C batteries to work, and the velocity-sensitive pads offer realistic sound, which is on the same quality level as traditional drum kits. The list of benefits doesn’t end here. The tool also offers plenty of percussion voices, ten effect voices and more than fifty play-along songs. The LCD makes everything easy to access, and the AC adapter will come in handy in more than one occasion. It’s hard to find a machine that offers more versatility than this one. Good drums are hard to find, especially if you want something with solid frames and stylish colors. Its dimensions are scaled down to accommodate young drummers aged three to seven and to be portable so you can move them by yourself whenever it is time for a new concert. In the box, you get a 16″ bass drum with a foot pedal, a standalone snare drum, the hanging tom and a hanging crash cymbal. If your kid needs to practice right away, the manufacturer included a lightweight pair of drumsticks and an adjustable, comfortable drum throne, which will make practicing less of a chore and more dynamic. The package is a good deal not only because of its price but because it is a fully functional and all-inclusive drum kit. These drums tend to spark a child’s interest faster than other instruments because they are cool-looking, inviting and they offer immediate gratification. Being able to play an instrument, no matter if a friendly and small beginner drum set or something else, is a fantastic skill for anyone to learn. That’s why you should be passionate about encouraging your kids to take up music. But making sure you buy the best kids’ drum set can be challenging. Lucky for you, you don’t have to research the topic yourself, as this guide will teach you what to look for in a set. For example, pay attention to materials and craft quality, to how many pieces you get for your money, and of course, that they have the proper size for your kid’s height. Let’s start with the snare drum. It usually is the center of the kit. The piece serves the strongest regular accents, it is versatile and the backbone for many fills. Also, make sure its position can be changed, especially if your kid is left-handed. Additionally, invest in a good drum stick made for lefties. Next, we have the tom drums. These are also known as tom-tom drums, which might sound like a funny name, but their tonality is anything but that. They are played with wood sticks, preferably, and a drum kit can have up to three of these tools. They serve the bulk of most drum solos, and their importance is undeniable. Bass drums are also popular elements, and they are also called kick drums. The models have a low pitch and provide the basic beat, rhythm or timing element with elemental pulse patterns. The shape can differ from one manufacturer to another, but their purpose is the same. Other drum kinds include octobans, rocket toms, and deccabons, and they were made to extend the upward pitch range by smartly increasing their depth and diameter. However, these are not vital parts of a good drum set for kids. You can also find plenty of high-quality and unique cymbals on the market. For this part, you have to think about your kid’s age. Not only that, but you also have to consider the fact that children grow fast, and you want the set you go for to keep up with his or her growth. It might be a good idea to pick one that can be used by all your kids, and not just one. After all, some children are going to be taller and some shorter, and there isn’t such a thing as a universal junior model for sale. You need to make sure that every piece from the bass pedal to the crash cymbal is easy to reach and comfortable, and that the kid doesn’t have to extend his or her arms too far. If the set also comes with a drum throne, that too needs to be adjustable so that the kid can reach the high and low points of the drum set, reviews of drum sets for kids tell us. Some people recommend you buy a comfortable and soft trombone stand, as an alternative. Don’t think longer drumsticks are going to solve this problem, as they won’t. One last and significant thing to consider before investing in a cheap kids’ drum set is whether to go electric or acoustic. There are advantages and downsides to both of those, but in the end, it’s more of a matter of preference. Electric kits for sale are exceptional for learning on and can be easily positioned to resemble a traditional layout. They are also ideal while on the go since their weight is smaller and their size is more compact when compared to classic drums. One downside could be the fact that those products need electricity to work. The sound they provide is also a bit more artificial, even if electric drums offer more versatility when it comes to sounds. Acoustic kits require a lot of space, but they are more suited for concerts. If your kid is serious about music, then experts suggest you go for a traditional set and acoustic drumming accessories. Although, a premium and light electronic drum set is ideal for those who like to write music too. How big are junior drum sets? A junior drum set, pretty much like a basic adult one, can include up to five pieces. It usually contains three toms, a kick drum, a snare, a cymbal and, more often than not, a hi-hat. Note that cymbals and also hi-hats are not usually counted as pieces. Moreover, this number differs from one manufacturer to another. Sellers also offer drumsticks with their sets, but others don’t, which can be quite frustrating, as you’ll have to buy them separately. An average size when it comes to drums for beginners is about 10” x 5”, with the snare measuring around 11”. A comfortable depth for beginners should be around 5” deep. The bass drums you go for should have a diameter of 16” which is ideal for producing rich sounding bass. All the stands and the seat should be adjustable, as the right dimensions vary from kid to kid. And since they grow up so fast, you also want the set to be able to keep up with them. The right size also changes with the age of your kid. If your boy or girl is between three and nine years old, a standard junior drum set will probably be ok in terms of size and accessibility as well. The critical thing to learn is that an appropriately-sized set will give your baby proper control and reach. When using a full-size adult set, they would likely have increased difficulty reaching the foot pedal and moving towards the drums effectively while playing. However, once your child turns ten, and if serious about playing this instrument, it might be worth considering the more significant investment in a full-size entry-level product. Reiterating, make sure the product is not too small or too big and that the drums are around the ten-inch threshold. Do look for adjustability, as that is going to make both your lives more comfortable. Keep in mind that accessories should be of the same size, except when buying an accurate and energy-efficient metronome for drummers, since those are universal. How much should drums for kids cost? Determine how much you can afford to spend on your child’s new drum kit before you hit the shops, to avoid any unpleasant surprise. These products, like all musical instruments, come in a variety of prices, from budget-friendly to premium. But there are a lot of great value alternatives and accessories on the market. We think a pedal will be a nifty addition, just like a good and helpful tuner pedal is for the guitar. You can for sure pick up an excellent quality set for a reasonable price if you do your homework. 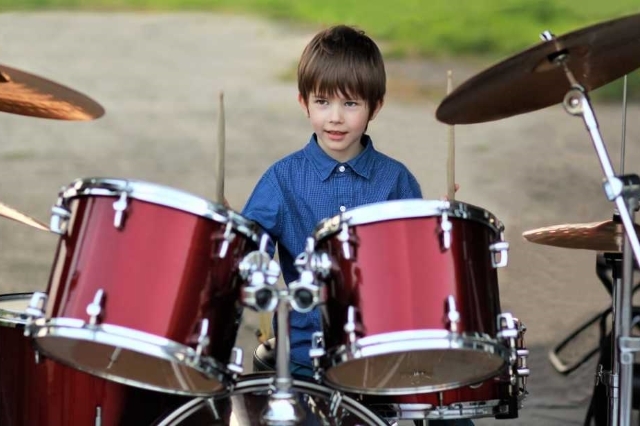 It may be smart for your wallet to opt for a less expensive model because there’s always the possibility that your kid may not want to play the drums as she or he gets older. But at the same time, paying the premium price means you’ll get something that will last you for many years, which is especially smart if you have younger kids that could inherit the set. The market prices for adult drum sets are between $399 to $10,000, but kid’s products don’t come even close to that exorbitant sum. You can easily find a decent and complete beginner drum kit under 500. Although, keep in mind that products that cost less than $100 might be toy drum sets and not actual instruments that you can take advantage of. We would recommend investing in something that is around a few hundred dollars, especially if it has an innovative drum practice pad included in the box. It’s always fun to read cool facts about drums, their history and about how they shaped the world. They have been part of our human saga for far longer than people give them credit, that’s why we think everyone should learn some critical points about drums, drummers and the best songs which rely heavily on this instrument. They are old. Drums made from alligator skins have been discovered in Neolithic cultures, mainly located in the area where you can now find China, dating as far as 5500–2350 BC, which predates the development of agriculture in Japan. In literary records, drums had shamanistic characteristics and were often used in ritual ceremonies. Even today, in remote areas of the Amazon and the African continent, they are still used for the same purpose. Macaques, a small species of monkeys, were observed to drum objects rhythmically. It is believed they do that to show social ranks and establish dominance. Other primates like gorillas make drumming sounds by beating their chests or by hand clapping. And rodents such as kangaroo rats generate similar sounds smashing their tiny paws on the ground. Scientists believe there’s an evolutionary link between drumming and the development of vocalization. Others think it became so popular because it is a distinct sound that you can recognize instantly, especially since it is not something that nature can mimic. In the Medieval times, drums were used not only for their musical qualities but also as a means of communication and as a warning system over great distances. The so-called “talking drums of Africa” are used even today to imitate the patterns of spoken language. Going further to Asia, throughout Sri Lanka’s history, drums have been used by authorities for communication between the state and people. It’s no surprise if you think Sri Lankan drums have a rich history stretching back over 2600 years. Musicians like beating records. And drummers like doing the same thing. The longest recorded drum session by a single individual lasted 122 hours, 25 minutes and a few seconds, and it was accomplished by Kunto Hartono, in Malang City, Indonesia. This took place from December 27th, 2011 to January 1st, 2012. What is modern drum playing without a pedal? These nifty additions were invented by Ludwig Drums, who laid the foundations of the first workable bass drum pedal system in early 1909. Thus, the company paved the way for what became the modern drum kit. Another cool thing is that electric drums became very popular in the eighties. Many musicians thought that they would instantly make traditional drum kits obsolete, like the ever so popular acoustic electric guitar almost did for traditional pieces. However, to everyone’s surprise, most drummers ignored them. And still, to this they, most professional musicians prefer acoustic kits. Experts craft drum shells from different woods and each has distinctive characteristics. Maple, for example, has a warm and resonant sound, loved by folk musicians. Birch has a slightly more aggressive tone and far less resonance, ideal for rock music. Mahogany and oak are suitable for higher volume drums. The framing is usually made of sturdy metals. Drumming is recognized to be one of the greatest forms of exercise for those who live far from the gym, as it burns more calories in a thirty-minute session than cycling does. Actually, it has even been transformed into an actual workout by an enthusiastic company called Drums Alive, which involves aerobics and jamming on exercise balls. Another piece of cool trivia that you might not know is that the modern drum kit was developed during the 1930s. Before that era, musical bands used at least three people to control the drums in large orchestras. Nowadays, the average drum kit has five pieces: the bass drum, the essential snare drum, two toms and several cymbals. However, the world’s largest drum kit had a whopping 813 pieces, and it took more than 36 years to build it. The loudest ever recorded drums were extremely dangerous to your health. An Australian named Col Hatchman holds the recorded, although nobody knows what his motivation was. He hit a mind-blowing peak of 137.2 decibels during a show in Sydney with his band Dirty Skanks, in early August 2006. Another drum world record, according to the Internet, is Moby’s 1000 song from 1992. People say it has the fastest ever BPM out of all official singles. It purportedly reaches 1000 BPM, as its name suggests, but there’s no record of that on the Guinness World Records website.